Gear? Ooops! | Tennessee Aircraft Services, Inc.
“There are those who have and those who will.” You’ve heard it. I’ve said it. You may have said it, but we really only believe it for the other guy/gal. My formal education doesn’t include any psych classes so I won’t try to analyse why we forget to put the gear down. What I know from the cumulative experience of all those pilots for whom I’ve repaired their planes is that it’s about the same event as locking your keys in the car. Usually, just as your fingers release the car door with no hope of stopping it, you realize t he keys are still dangling from the ignition. It’s about the same for the gear, but the ramifications last longer. 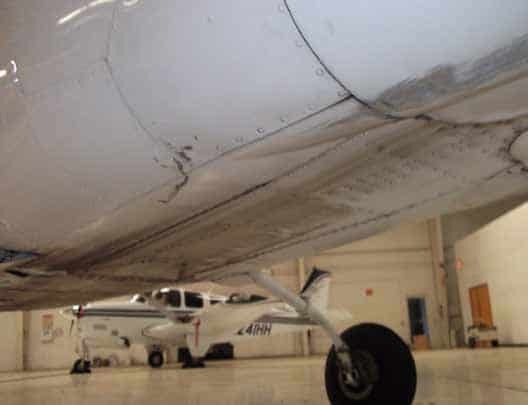 Insurance companies have the thought firmly ingrained in their rating system that most retractable gear piston singles will have some sort of landing gear problem and it’s going to cost a lot of money. 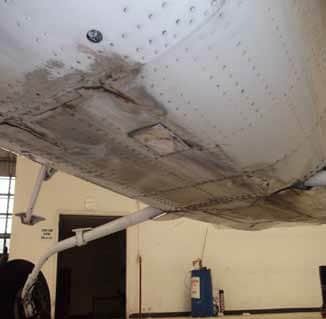 There are a few things to know about the undercarriage of your plane that may help mitigate the possibility of an unintentional or forced gear-up landing. Again, I’ll try to stay out of your head and focus on the mechanical stuff. The next time your plane’s up on jacks, take advantage of the opportunity to practice proper landing gear manual extension techniques. Follow the procedure in the POH exactly as if you were flying the plane. It’s a fairly simple process on all the hydraulic-actuated Cessnas, but does take some time. After you’ve pumped the gear all the way down once, retract it and go through the process again while timing yourself. You’ll discover that making 75 strokes with the hand pump is not something you want to do on short final to landing. A little practice and you’ll find manual gear extension isn’t anything to fear. While the plane is on the jacks, check the operation of the warning horn. Single engine Cessnas use a switch on the throttle control to detect its position and activate the warning horn. The general idea is that the warning horn should sound at some predetermined power setting that you’ll select prior to the landing flare. Check the horn while flying as well, to make sure it’s loud enough to disrupt your thoughts while wearing that $1K super duper active noise canceling headset. It’s also a good idea to check the horns operation in several different flight scenarios so you’ll know when it’ll activate or to know how to have it adjusted. Unfortunately, the switch can only detect the mechanical position of the throttle whose specific position doesn’t equate to the same engine power output or aircraft speed. Altitude, aircraft weight, climbing, descending, and CG all play a part in what airspeed a particular throttle position will yield. You might make this a regular part of your pre-landing checks to help detect any failure in the system before you need the system. On a rare occasion, there may be a situation when you know all or some of the landing gear do not extend properly. Understanding the options will help keep you from turning this incident into an emergency. An emergency means the medical field gets your business; an incident means someone like me gets your business. The first and best option is to land with the gear as is. Regardless if all or some of the gear won’t come down, there’ll be some damage to the plane but you and all your passengers will simply walk away. Next you’ll make a few phone calls to your insurance agent, mechanic, and the FAA . If one main gear won’t extend properly, the plane will settle down and turn towards the retracted gear side as it slides to a stop. You won’t be able to fully open the cabin door on that side so everyone will exit the high side. When flying a P210, if the problem gear is on the left, you’ll plan to exit through the right side emergency door. If both main gear fail to extend properly the belly will drag a bit under the baggage bay area then everything will be fine until the plane comes to a stop. The extended nose gear will act as a fulcrum and the plane will lay to one side damaging the horizontal stabilizer and elevator. This is the least expensive of the possible gear combinations because the prop and engine are not damaged at all. Side note: Because of the high wing, if you’re a really fast thinker, you could leap out as the plane comes to a stop and hold the plane balanced so neither wing falls to the ground; but then again, let’s stay with the theme of not creating an emergency. If the nose gear does not extend properly, you’ll land and flare as usual, but the final at-rest deck angle will be to the negative. The prop, engine, nose gear doors, nose wheel well channels, and the lower cowl skins will be damaged (and while that may sound bad, please read on for how to make things worse). Another option is to turn this relatively simple event into a full blown emergency. You could make a dangerous low pass by the control tower so they can tell, at best, how many wheels they see. But, they have no way of knowing if the locks are in place. You could even have someone fly along side to tell you the same useless information as the tower; only difference is, formation flying with no training by one or both pilots is a definite recipe for disaster. I have seen its results. It is a tragic, deathly disaster. Another way to create an emergency is to cut off the engine just before landing. There is no advantage to this move and several disadvantages. The prop won’t stop turning so it won’t save the prop and engine from damage. With the engine shut down, you have effectively removed almost any option except landing straight ahead, no go around, no adding just a bit of power to help get across the fence, etc. Shutting off the engine, in itself, creates an emergency. Just how many times have you practiced landing with the engine totally shut off? The drag produced by an engine at idle is very different from an engine that’s not running at all. What’s going to be your glide ratio, and are you sure you’re going to make it to the runway? Imagine the extra embarrassment explaining why you tore the main gear out of the plane by catching the edge of the runway threshold. 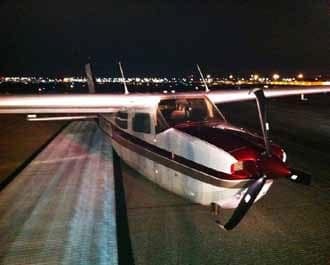 One more thought, if you know it’s coming, try to land on a low use runway or even a taxiway. If you’re plane is sitting in the middle of the main runway at Super Metropolis International Airport, they won’t think twice about dragging your Cessna out of the jet traffic by the most expeditious means possible -a steel cable lassoed around the tail feathers worked well at one airport and it was…ugly. I’ve replaced belly structure on almost every make and model of piston, single engine, retractable gear airplane at least once, and there is one comment I’ve heard from 100% of the pilots that landed them: “except for the horrible scraping sound, it was the best landing I ever made,” or words to that effect. These are all from pilots who simply forgot to extend the gear; they are high-time experienced flyers, low- time, commercial, and private. Usually these events are a result of some outside influence disrupting the pilot’s normal landing sequence. ATC wants you to keep the speed up for traffic, or maybe a go-around is initiated due to something pulling out on the runway, or it’s simply a straight in approach instead of standard pattern. Analyzing all that is for those folks in the lab coats, but suffice it to say it’s all in your head, and only the pilot can take actions to mitigate it. I cannot say that it is impossible for a gear-up landing to result in injury, fires, or flipped airplanes, but it is so rare I can’t think of it ever happening…ever. When the first scraping sound is heard, one’s heart sinks with the full realization of what is happening. Then there is a sudden flurry of thoughts about what might be done to save the situation; put the gear down, give her full throttle and try to go around, yank the yoke back and hope to get high enough to drop the gear -Don’t do it !! -That’s when the injuries and other things become more plausible. So you relaxed and chose the less damaging path, you’re out of the plane, standing near the shame, and the first order of business is getting the plane off the runway. The really big airports will have equipment on hand for this event. At most airports, your best hope is that the local mechanic has the capacity to relocate the plane. On small, unattended runways…hope and pray you don’t end up in that situation, because help could be hours or days away and the airport will have to be closed the entire time. Having a smart phone can pay off big at the little airstrips, because you’ll be able to find all the needed phone numbers on the Internet. Assuming air traffic control hasn’t made the call for you, the FAA is the next call. Most FAA Flight Standard District Office (FSDO) inspectors rotate the on-call accident duty so you may get a very experienced General Aviation (GA) inspector or you may talk to someone who’s entire career consists of heavy iron jets. Either way, they’ll know the regulations and will be interested mostly in the paperwork. A GA knowledgeable FAA inspector will understand that you’ve just had a traumatic experience which you’ll go to extremes to not repeat. However, he/she still must go through the formality of discussing remedial training or some kind of check ride but that all happens later. For now it’ll just be the facts. Now you’ll call the insurance company and I know we all keep that number handy… No? You might want to look the number up and add it to that smart phone. If the insurance company is aviation savvy, they’ll know what happened and probably already have a good idea what it’ll cost to repair. Unless this event happens in early January, it won’t be their first gear up call of the year. This is where your insurance pays off; they’ll pay for damages caused by the accident but not for the cause of the accident: I’m not talking about the time you may want with a therapist to solve the cause of forgetting to put the gear down, rather the mechanical failure that prevented the gear from extending -like a broken hydraulic line or a totally fried pump. The insurance company’s reasons that these are regular maintenance items and should be kept in functioning condition. There may be some exceptions. Later, you’ll call the shop or mechanic who’ll perform these major repairs. Now we can talk about a subject I really know something about, but I’ve run out of paper so we’ll pick it up here next month…. Stay tuned.